I hardly ever cook pork at all in my kitchen simply because my late dear LT never liked eating it. I remembered when I made this particular dish, he said the house had such a "porky" smell and he kept covering his nose. In a way the smell was kind of "porky" in the beginning but once the spices started to develop into the dish, it was really quite fragrant. 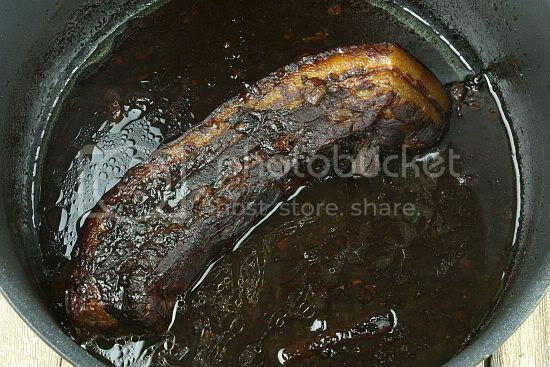 I simmered the pork belly for about 3 and a half hours and by the end of it's cooking time, the sauce had become very dark and thick.The meat was also very soft and smooth. In fact when I started slicing the pork belly, the meat was practically falling apart. 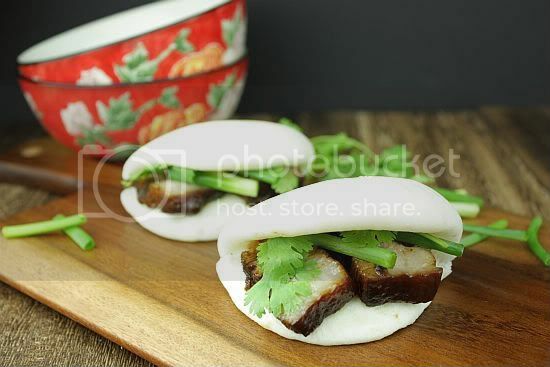 I decided to serve the slices of pork belly with steamed Chinese buns. I also added thin slices of cucumber and green spring onions. The buns were bought from a local supermarket and I steamed them first before adding the pork slices in-between each bun. This particular dish is now very popular in Chinese restaurants and you can also find food kiosks at local shopping malls selling them as well. A small bunch of cilantro leaves for garnish. 1) Use a large dutch oven or heavy pot big enough to lay the pork belly insside. 2) Heat up the oil, then add the ginger and garlic. Then add the five spice powder and other spices. Cook for about 2 minutes until fragrant. 3) Then add the pork, skin side down over the garlic and spices.Add enough water to completely cover the belly and a bit more. Add the dark and light soy sauce. 4) Put the lid on the pot and turn the heat up to high and bring the pot to a boil. Skim any foamy scum from the top. Then, open the lid slightly, and let simmer over low heat for at least 3 hours (skim occasionally) or until the pork is falling off the bone tender. 5) Once the belly is ready, remove it from the pot. Then reduce the sauceto a thick, caramel like consistency. 6) To serve, warm back the pork belly. Slice it thinly and lay on a plate. Drizzle the gravy and garnish with sprigs of cilantro. 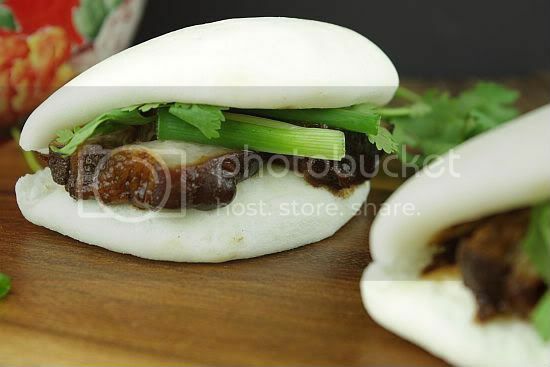 Alternatively you can serve the pork belly slices with steamed Chinese buns. 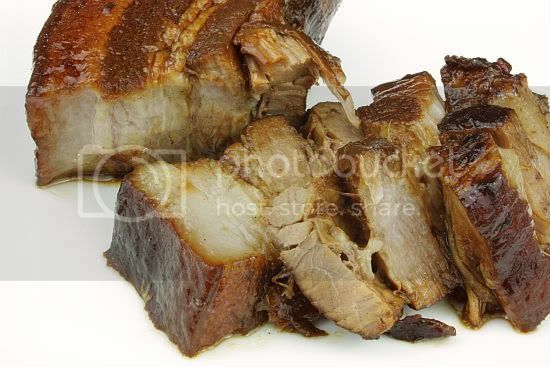 Jo, my hubby loves braised pork belly very much and I cook this at least once a month. wow love love pork belly especially in thick sauces like this! I made some 5spiced pork belly yesterday too...so delicious! Jo, what a perfect timing. I was craving for these and was about to pick up a pkt of pork belly till my helper told me no more pork for this week. haiz... so now drooling on yours. My hub would drool at your pics! I cook this once a month minus the five-spice. My family doesn't like the flavour. I use lots of garlic. You know what, I actually enjoy eating pork belly. But, I don't dare overindulge myself in eating it. I've always loved the idea of using five spice powder in preparing chicken and pork dishes. Love your way of serving the pork belly. I hardly cook pork at home as Carlos is not a fan of it. He think it is too porky. I actually like eating this type of stew pork once a while. I have to wait till I go the Chinatown to get a good piece of pork belly to cook this. Jo, I like this dish but I hardly eat it cos have to watch diet, even if I eat I will try to remove the fats, I dun like fats since young heeheehee... You are tempting me! Those look great...! I had them about 3 years ago in a restaurant, it's time for me to make some at home now. Thanks for sharing :). gyaaaaaaaaaaaaah!! that looks too good! Hey Jo, this is one of my favorite dish especially sandwich with man tou. But, nowadays have put on lots of weight and thinking how much I can eat this. I think once a while is ok right! Especially for Chinese New Year, it's a must to have this haha.. Ok, bookmarked it. Try it in big occasion :) Thanks for sharing! I got to stop looking at your pork belly, it's really hard to resist! looks scrumptious and yummy.. slurps..
Buns was purchased from a local supermarket and he steamed them first before adding the sliced pork sandwich in-between. This particular dish is now very popular in Chinese restaurants, you can also find refreshment in the local mall to sell well.